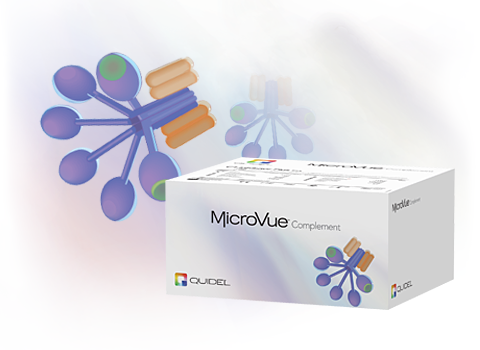 The MicroVue C1 Inhibitor Plus EIA measures functional levels of C1 Inhibitor protein present in human plasma or serum. C1 Inhibitor is a multi-specific protease inhibitor present in human plasma and serum. Among the proteins it regulates are C1s and C1r of the C1 complement complex. Genetic deficiencies of C1 Inhibitor are of two types: functional deficiencies (protein is present but not functional) and antigen deficiencies (protein not present, or more commonly present at a low level). Either of these may lead to life threatening angioedema (HAE).. In the assay a proprietary, biotinylated, activated C1s in the reactant complexes covalently with functional C1 Inhibitor in the sample. In the second step, the C1 Inhibitor-C1s-biotin complex reacts with the avidin coated plate. The bound complex is then detected using an Anti- C1 Inhibitor Conjugate. The level of C1 Inhibitor function in the sample is proportional to the level of color development and can be measured against the standards provided in the kit.